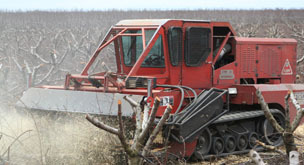 Efird Ag Enterprises Inc. is a family owned, diversified farming, harvesting, trucking, and shredding operation. Matt and his father Russel farm over 1,300 acres of almonds, wine grapes, raisins, prunes, walnuts, and plums. Located in the heart of California’s Central Valley, Efird Ag has been serving the shredding needs of over 200 satisfied growers annually since 2005, while operating only one Flory Powertrack Shredder! With the recent acquisition of DSB Custom Shredding, Efird Ag has expanded its shredding services to include (3) Flory Powertrack Shredders. Being a grower himself, Matt understands the importance of high quality of service combined with competitive pricing. This is why Efird Ag Enterprises Inc. works closely with each and every company to minimize their cost of shredding and ensure the job is completed in an efficient and timely manner. We look forward to the opportunity to earn your business and serve your shredding needs.